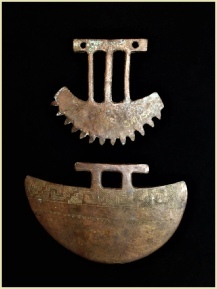 A pair of heavy ornamental bronze circular axe blades with irregular form. Both are cast and hammered on the cutting edge. One having a crescent shaped blade with pointed prongs and a triple supporting hafting base with two holes. The other is a half-moon shaped blade engraved with geometric designs on both sides and a double supported hafting base. Inca, Peru ca. 15th century. Measures: 5.5”/13.97 cm x 6”/15.24 cm; 5.5”/13.97 cm x 9”/22.86 cm. Arranged in a 12"/30.48 cm by 16"/40.64 cm by 3”/7.62 cm black shadowbox glass display case. Provenance: Private Fort Lauderdale, FL collection. Acquired 1980’s.